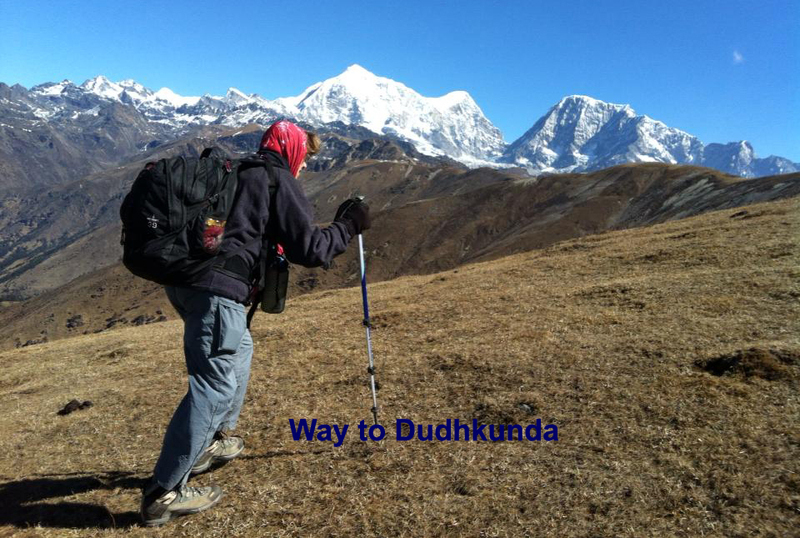 Dudhkunda Trek via Pikey Peak is a complete new nature concept Trail besides the other treks in Nepal.The Trek lies in Solukhumbu district (Sagarmatha zone) on the northwest corner of Nepal. This Trek is consist of virgin nature, although expect non touristy and non crowded thrilling journey.Dukunda (Milky ) lake is a sacred Pilgrimage site. 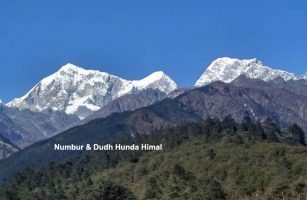 Isolated hidden religious Dudhkunda (Milky lake) is situated at an elevation of 4560m in the lap of Numbur Himal and Dudhkunda Himal.The Numbur Himal is believed as protector of This valley. Especially the holy lake is worshiped by Khaling Rai (Kiranti) Pilgrimmers of this valley on the occasion of full Moon (August) with their Shamans (Dhami/Jhakrees). It is believed that in order to live love,get rid of sin, being free from evil, vanish sorrow and grief, along with to get descendant spouse who does not have ,disease is cured while bathing from the holy lake freshwater according the legend of the tribe of khaling Rai (kiranti) ancestors. Here is the belief that the Water fulfill the wish. Khaling Rai (Kiranti) is a different kind of surname and a species who worship earth as a God.They have their own language, costume, dance and their famous culture practices is Bhume(was/Chandi),Nyagi. 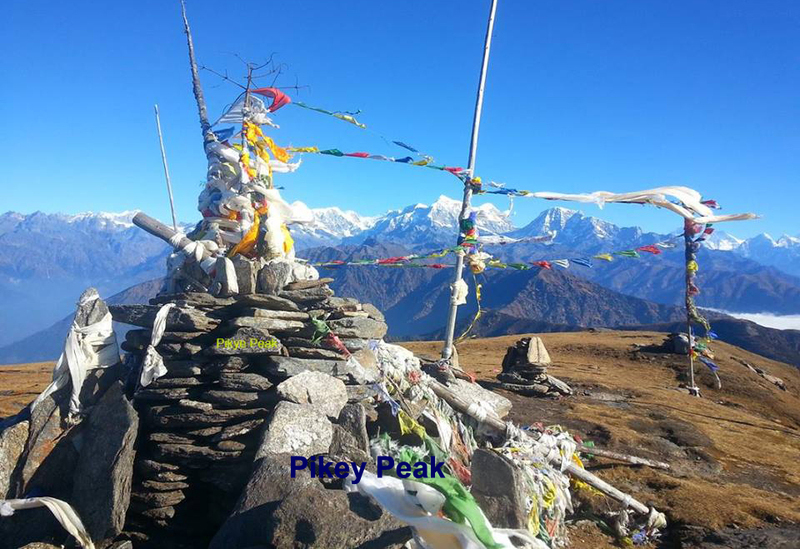 Dudhkunda Trek via Pikey Peak means to explore virgin nature and isolated hidden kahling Rai culture . 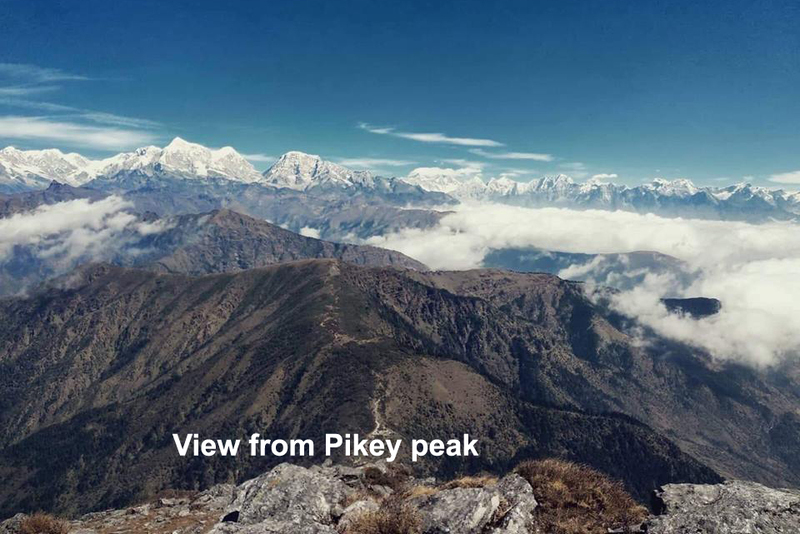 Along with Dudhkunda Trek via Pikey Peak offers another wondrous view of Mt Everest,Kanchenjunga,Makalu and Gaurishankar massif from the Top of Pikey peak .Apart from this, in this valley Sherpa people residents on the upper part of solu but on the lower part big settlement of Khaling Rai. There are other but little like Magar,Gurung, Tamang,Kami,Chhetri,karki and Bramin.They have good harmony between caste ,religion and Culture. In this Trek you walk through the Rhododendron forest, Pine forests and pastureland. -Culture of khaling Rai and Sherpa. -Non Touristic & non crowded Trek. This is absolutely remote, non touristic and non crowded trek.Do not expect luxury lodge.You walk through the Jungle(forest) and pastureland in the lap of Mountains and on the Top of peaks during your Trek.You sleep in a Tent. 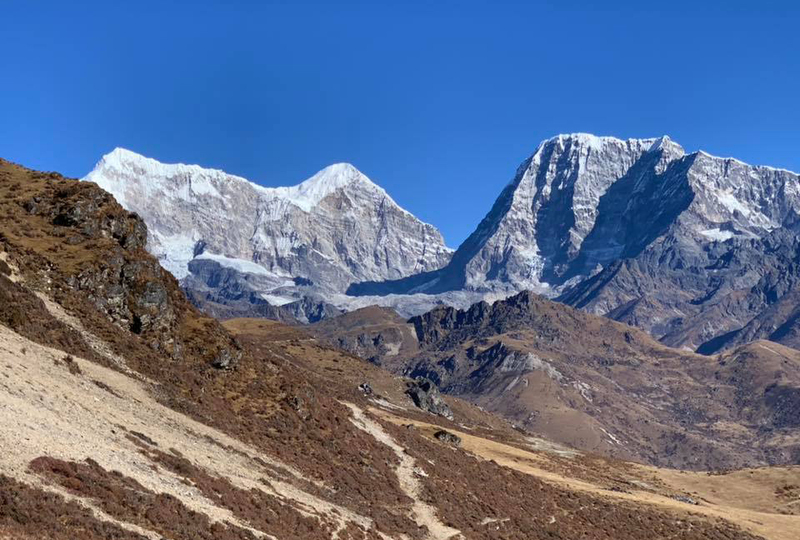 you walk up to 4560m.It means, you have to be strong physically to walk.For solo Travers and for lodge expected Trekkers it is not possible but in the Groups for Camping Trek, very honestly it can be the best trek travelers who are Nature and Culture enthusiast. You make unforgettable memories. If you want to see khaling cultur with pilgrimmers recommended months is August. 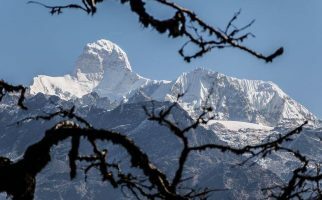 Likewise, We recommend you Spring season ( March-May)This season is Rhododendron blossom time.And (Oct-Nov) Autumn season is another trekking season in Nepal. Furthermore September ,December, January and February also possible to Trek in this region. Bitter cold but weather is good for Trekking. Sky is blue and snowcapped standing Mountains will be welcoming you. -For camping trek we provide you sleeping tent with pillow and good mattress during the trek. Along with Toilet tent and Dining tent. -At lodge we do not cook, we provide you Menu and order yourself as you like. -for Tent Trek sleeping bag is compulsory bring yourself. -we have experienced, trained, professional Knowledgeable Trekking Guide, Trekking Camping Cook, staffs. Safety and security is our first priority in our mind. During the trek You will be with our staffs and in the Kathmandu your pick up and Drop will be done by our Agency. Like that, our staffs have Trekking insurance in case of accident. They are either safety and secure. They have good trekking equipment during the trek that we provide by our Agency. At lodge you get electricity for charging your Mobile and Camera batteries but during your Camping Trek we provide you Solar power for your comfort. In case of emergency call we provide to our staffs, NTC and Sky Network Mobile. Day 02: Kathmandu1350m- Phaplu/ Salleri 2390m. Day 03: Salleri/Phaplu 2390m.-Ratnange Khola 3300m. Day 04: Ratnange Khola 3300m.-Kemje Everest View pont-Taksindo 2960m. Day 05: Taksindo 2960m.-Sarkaripati 3430m. Day 06: Sarkaripati 3430m. –Beni 3835m. Day 07: Beni 3835m.-(Dudhkunda Hiking Day) 4560m. Day 08: Beni 3835m.-Yak Kharka 3400m. Day 09: Yak Kharka 3400m.-Taktor 2900m. Day 10: Taktor 2900m.-Bhanjyang 3549m. Day 11: Bhanjyang 3549m.-Pikey peak 4067 panorama hiking day. Day 12: Bhanjyang 3549m.- Loding-Phaplu 2390m. -Airport Pick & Drop by private vehicle. -Trekking Guide, Cook and porters. Option 01:Today we drive about 9 -10 hours by Jeep 295 km from Kathmandu to Phaplu/salleri. Today on the way, for the tourists there are not such good lunch places .Therefore we offer you packed lunch. After Okhaldunga you will see very beautiful mountains if you have good weather(Everest Panorama). And with porters meet in Salleri/Phaplu. Or you hike to Salleri Local Mark and visit the campus. 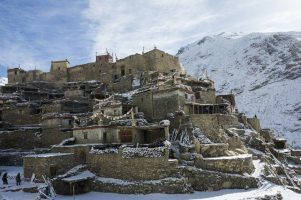 Option 02: 30 minutes fly to Phaplu 2470meters from Kathmandu.Then walk to Chiwang Monastery 2600m.The Monastery is very old within the forest near the small Chiwang village. After breakfast walk up through the pine and Rhododendron forests by crossing the small village.You will enjoy the view of Numbur ,Khatang and Everest panorama.On the way there are no lodges, therefore you have to prepare well for drinking water and some Biscuits or snickers. Ratnange Danda is the first view point. After Lunch, make short panorama hiking around your Camp site. At night, you can do Campfire with your Trekking staffs. You are entering Dudhkunda valley from Today. when you start to walk from Taksindu ,the trail follow north east direction uphill to Taksindu la 4o minutes approx. Then walk through the pine forest and Rhododendron forest easy way to Kerungpati 2 hrs approx.Plus 2hrs,from here continue walk uphill to Sarkaripati.you will stay here in Tent, do not expect lodge. 2 hrs walk uphill to Kamo Danda through the Forest.Then leave the Tree Line and it comes View point place.From the view point, you enjoy the view of Mt Everest,Kangtega ,Thamserku further more peaks.From here follow the flat trail to Janwle Khola 2hrs approx.You can have Lunch here.After lunch walk slightly up and downhill to Beni 3 hrs Approx. 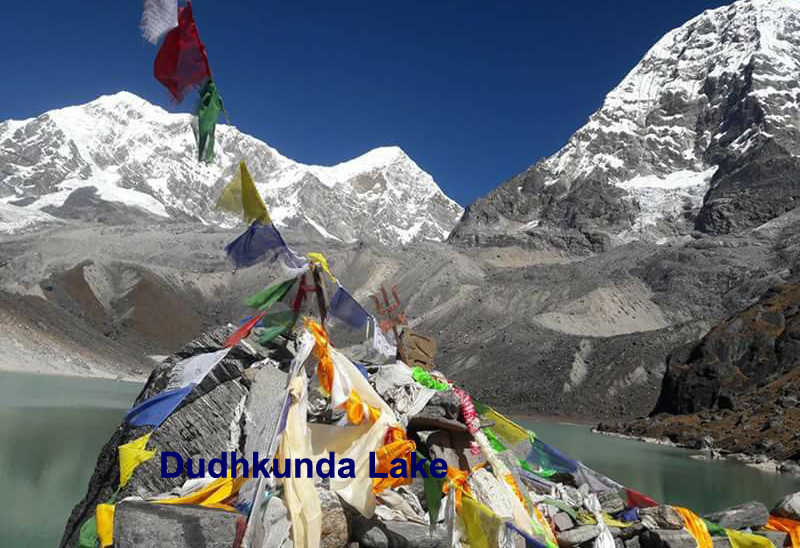 You have Dudhkunda hiking day today.After Breakfast hike to Dudhkunda (Milky lake).It is Holy lake in the lap of Numbur himal,Khatang and Karyalung.It is pilgrimage place on the occasion of celebration time in August more then 100 of devotees come here.Further more you can see here Prayer flag and Trident around the lake. Especially the holy lake is worshiped by Khaling Rai (Kiranti) Pilgrimmers of this valley on the occasion of full Moon (August) with their Shamans (Dhami/Jhakrees). It is believed that in order to live love,get rid of sin, being free from evil, vanish sorrow and grief, along with to get descendent spouse who does not have ,disease is cured while bathing from the holy lake freshwater according the legend of the tribe of khaling Rai (kiranti) ancestors. Here is the belief that the Water fulfill the wish.After visiting Holy lake get back to Tent. Note: you not pack your luggage, leave in Tent.Just take with your Trekking Rucksack, drinking water,Camera and some Biscuits or pack Lunch. The first cross the Beni River then begin half an hrs flat waking and follow the Rocky trail(not danger) to pass 3900 m+ 3hrs ascend. Again, from the pass descend to Yak kharka 3hrs.It’s your camp for today. Yak kharka mean sheds of Yak. Still not yet houses but from here you can see refuse Camp Thupchen Chholing Gompa ,Junbesu and Mopung valley. Walk downhill 2 hrs through the Thupchen Chholing Gompa.At this Gommpa there are Thousand of Monks and Nuns.Most of them are from Tibet.Tibetan camp was established in 1960 and Gompa in 1968.This place is known as Tibetan refugee Camp either.After Visiting Gompa 1 hrs descend to Junbesi.This place is known as Sherpa village.Here are many of Lodges.This is known as Everest classic Trek.From here walk uphill 1hrs then 2hrs slightly flat trail toTaktor. Ascend to pass (3500m.) through the Rhododendron and pine forest 3 hrs approx.From the pass,you can see the view of Pikey peak and Numbur Himal.After pass, 2 hrs walk downhill to Bhanjyang. Early in the morning 2.5hrs ascend to pikey peak sunrise Panorama of Mt Everest,Kanchenjunga,Gaurishankar and Makalu massif.After enjoying the panorama get back down to camp and have breakfast. Descend to Loding Magar and Sherpa village 3hrs then follow the 1hrs Motor Road before to Solu Khola (River).After crossing Bridge of Solu khola 2.3 hrs ascend to Phaplu. In the evening Farewell dinner with your Trekking porters and Cook. Option 01:Today we drive about 9 -10 hours by Jeep 295 km from Phaplu/salleri to kathmandu.You have final chance to see the Everest Panorama on the Salme pass. Option 02: 30 minutes fly to Kathmandu from Phaplu.Then drive to Hotel. We will pick up you at your hotel and drop to International Airport on your flying schedule. Airport Pick & Drop by private vehicle. 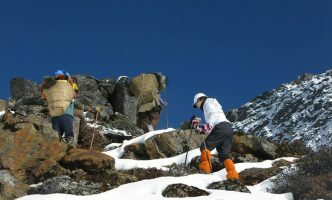 Trekking Guide, Cook and porters.